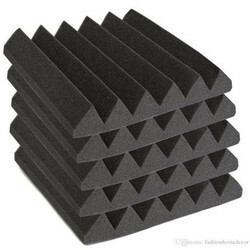 Our product range includes a wide range of acoustic foam wedge shape, pyramid shape acoustic foam, bass trap acoustic foam, acoustic foam egg try shape and acoustic foam. 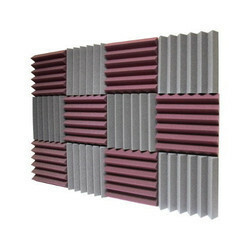 PAN GLOBAL ENERGY ACOUSTIC PRODUCTS India introduces Acoustic Foam Wedge Shape for sound proofing which are thick acoustical foam and are a great solution for spot treating sound studios, home listening rooms, audiometric booths and more. With slightly more wedges per square foot than 2" acoustical foam, Wedges feature maximized surface area for greater exposure to sound waves. Pan Global Energy Wedges are a great solution for small flutter echo problem areas and, when spread apart, yield beneficial sound diffusion off their exposed edges.Wedge sound absorbers have a profiled face which increases the surface area available for absorption. Wedges can be an effective treatment for flutter echoes and standing waves which can be particularly problematic in rooms with hard parallel walls. Dampening them with acoustic Wedge absorbers can significantly reduce these problems. Office building, meeting room, office room, studio, recording room. Pan Global Energy Acoustic Products manufacturer and supplier of Pyramid Shape Acoustic Foam, which is the perfect product for the budget-conscious, yet acoustically-discerning, the customer. 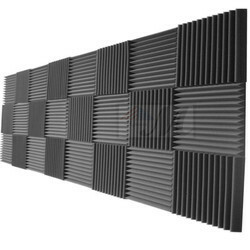 These Pan Global Energy Wave Foam acoustic foam panels are cut in the industry standard "pyramid" style to keep its price low, but it still outperforms competing "premium" brands that cost way more! Due to the manufacturing process we use, the pyramid pattern will not be square to the edges of the panels.You can feel the difference in your room as it dampens unnecessary reverberation and echoes. These pyramids make acoustic treatment easy as a breeze. Workplace application: office building, meeting room, office room, studio, recording room. Pan Global Energy Foam panels used for your studio /auditorium/ conference room/ office space /cinema etc. PS: to achieve to best soundproofing result, this could be used with one layer of sound barrier (MLV) as a composite assembly. Pan Global Energy Acoustic Products India introduces Bass Trap Acoustic Foam. Pan Global Energy Bass Traps are acoustic energy absorbers which are designed to damp low-frequency sound energy with the goal of attaining a flatter low frequency (LF) room response by reducing LF resonances in rooms. They are commonly used in recording studios, mastering rooms, home theatres and other rooms built to provide a critical listening environment. Like all acoustically absorptive devices, they function by turning sound energy into heat through friction.Since low-frequency resonances in a room have their points of maximum or minimum pressure in the corners of the room, bass traps mounted in these positions will be the most efficient. Bass traps are typically used to attenuate modal resonances and so exact placement depends on which room mode one is trying to target. Bass traps typically combine structural mechanisms that can work at both positions of high particle velocity/low pressure (thick foam) and high pressure/low particle velocity (membranes). We are offering Acoustic Foam Egg Try Shape to our clients. We provide high-quality products to our clients. 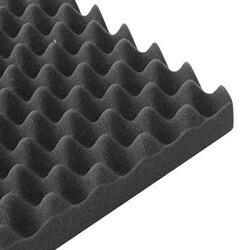 Looking for Acoustic Foam ?